No need to buy pre-made pasta salad at the grocery store. It is so easy to make it yourself, and you can customize it to whatever your friends and family prefer. 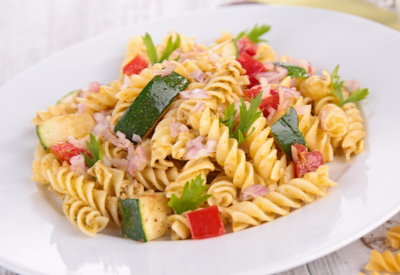 Zesty Italian Pasta Salad, served with our favorite vegetables. Every time that I purchased pasta salad at the deli counter in the grocery store, I knew that someone would be picking something out of the salad. Whether it was the olives that I don’t like or the tomatoes that a few of the kids don’t prefer, the store-bought version just wasn’t for everyone. That was when I decided to start making pasta salad myself. I pulled out a box of fusilli pasta and attempted to recreate the tangy dressing of Italian pasta salad. I use fusilli pasta for two reasons. 1. The pasta is easy to stab with a fork. There is nothing worse than trying to eat a bite of slippery pasta. You spend more time chasing it around on your plate than you do eating it. 2. The spirals of the pasta act like fingers and pick up the dressing and sometimes even the diced vegetables. This means that each bite is full of flavor. 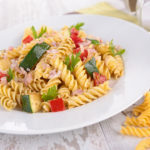 Tricolor fusilli pasta is my favorite pasta to use in this dish. 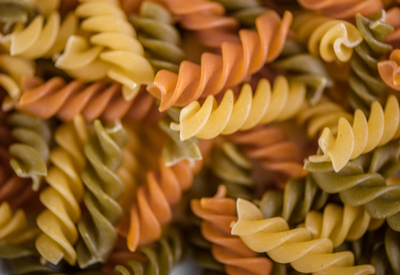 And yes, most of the time I prefer the tricolor fusilli. There is just something colorful about a plate of tricolor pasta salad! And if you choose or need to be gluten-free there are several options for Gluten-Free Fusilli Pasta. You can make your own dressing if you prefer. The instructions below include the ingredients of homemade pasta salad dressing. However, if you are in a pinch, you can use store-bought dressing. Just make sure it is Zesty or Robosto Italian Dressing. There are more spices in the zesty version when compared to standard Italian dressing. 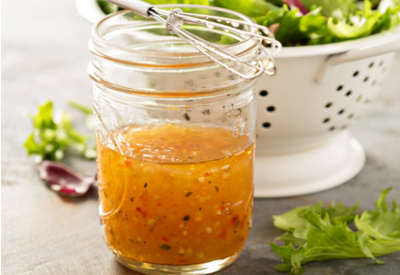 Homemade Zesty Italian Dressing – used for both green and pasta salad. The extra spices add a great depth of flavor that you would miss if you didn’t use it. Now is the time to add a few of your favorite ingredients to your recipe. The recipe included below is our favorite ‘everyone likes it’ recipe to feed a crowd. However, feel free to mix up the vegetables and add a few other speciality ingredients. For instance, add in a handful of diced up pepperoni. Or how about small mozzarella balls? And if you like black olives, you can even add those in as well. The choices are endless when it comes to homemade pasta salad. A quick, easy, and refreshing side dish that is perfect for any crowd, any time of the year! While the pasta is cooking cut up vegetables and set aside. Prepare homemade dressing (if using) by placing all the ingredients into a mason jar. Add the lid and shake well to combine. Add cooked and cooled pasta to a large serving bowl. Add vegetables and dressing and mix well. Refrigerate for at least 4 hours for best results. Prior to serving stir well.